This is really great news for pregnant women! For the first time ever, a team of Toronto researchers are using a combination of ultrasound and blood tests to screen high-risk pregnant mothers for placental damage. By completing these non-invasive tests, most high-risk mothers can be reassured that their placenta is formed and functioning properly, so they can expect a healthy pregnancy. The tests are done early enough, at 16 to 23 weeks gestation, so if results are abnormal, physicians have time to improve pregnancy outcomes. “Close to 40 per cent of high-risk mothers we see in our clinic experience placental damage,” says Dr. John Kingdom, Principal Investigator of the study and Maternal-Fetal Medicine Specialist at Mount Sinai Hospital. The research is among the first to look at placenta health – a vital life line between mother and fetus through which nutrients, oxygen, antibodies and hormones pass. 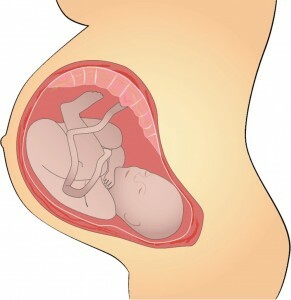 If the placenta is not functioning properly it could be a potential danger to the health of the mother and fetus. Abnormalities can lead to conditions such as preeclampsia, which is maternal high blood pressure, stillbirth or the need for a pre-term delivery. The screening tests include: a maternal serum screening test used to detect Down’s syndrome, which measures the hormone levels in the mother’s blood; a uterine artery Doppler blood flow test, which checks the maternal blood flow in the placenta; and an ultrasound of the placental shape. Of the 212 high-risk women in the study, 19 delivered early due to poor fetal growth. None of these women had normal placental function test results. Likewise, only two of 22 stillbirths occurred in women with normal tests, and these losses were not related to abnormal placental function. This data demonstrates that the placenta screening tests can provide a good indication of which women may experience complications during pregnancy. I would have LOVED to been offered this test while I was pregnant. I had an abrupted placenta and no one knew how much goodness was getting to the baby.